In April last year, I read, reviewed, and ultimately loved Jen Williams' The Copper Promise - a refreshingly fast paced, self-contained epic. 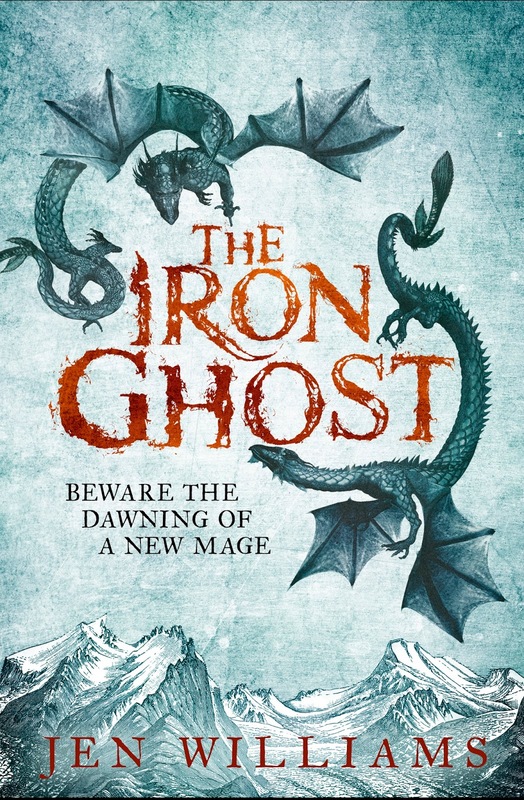 As such, I was very interested to see where the sequel would take us, and happily, The Iron Ghost's journey is equally interesting. (Plus, I can hardly disapprove of the pun on the cover. Sorry.) There will inevitably be some spoilers for The Copper Promise, as with all sequel reviews, so be warned! The Iron Ghost begins several years after The Copper Promise's rather grand finale - and more in the heroic than the epic fantasy vein. After their world saving exploits of the first novel, the Black Feather Three have been rather more mercenary, steadily building fame and fortune. However, not all is well between the three. Wydrin and Frith are divided by Frith's obligations - he feels he ought to marry strategically, as the last member of his noble family, and this is causing... understandable friction. Sebastian is dealing with the remnants of Y'Ruen's army - his own magically created daughters - and trying to find a way for them to live in peace. So when the Black Feather Three depart for their new job in Skaldshollow, we're far from the amiable status quo of The Copper Promise's ending. The Skalds traditionally use stone golems - werkens - quarried from the magic-rich stone of the mountain to labour in their city. But their way of awakening the creatures has been stolen by a neighbouring people, the Nahrl, who view the Skalds' practices as harmful to the local mountain spirit. When the Black Feather Three are hired by the Skalds to retrieve their property, the conflict soon escalates - an ancient mage, Joah Demonsworn, is on his way back, and soon both parties' problems are overshadowed by this entirely non-ominous sounding addition. So, first - what I loved. The Iron Ghost knows what it does well, and what is does well is Joah. Thankfully there's a lot of him. Yes, frequently I call out for more ambiguous antagonists. But Joah is a wonder: so assured in his own rightness, so anxious to ensure Frith is his brother in all of this... it's the combination of his utter amorality with his desperate affection for Frith that makes him such an engaging villain. Yes, it might have been interesting to have more of a possibility for redemption - but sometimes in heroic fantasy, what we need is a villain, and Joah is a fantastic one. Another aspect I should mention is the care for diversity. Often, epic and heroic fantasies have failed on this front, but The Iron Ghost clearly does well here: there's a gay protagonist who gets a romantic subplot, others in background, and the world isn't using the typical all-white fantasyland (Frith, for one, is not). And honestly, I appreciate this. It's not what makes the book good by itself, but it's important to appreciate some decent inclusions here, given how the fantasy genre has often disappointed - able to imagine entire worlds, but no POC or LGBT people in them, at least outside stereotypes. That said, The Iron Ghost suffers where its predecessor did: pacing. It seems to have difficulty in dealing with its subplots - the Frith/Wydrin issue, for example, barely gets touched before an attempted and rather hurried resolution (which is dramatic, yes, but I want character development rather than drama, which this lacks). Sebastian's romance meanwhile, gets almost shoved out of the way at the book's end, leading me to go back and search for scenes I'd accidentally missed. I can't help but feel that for a long book, The Iron Ghost could better allocate pages to these important interactions - just as I felt with the earlier Sykes novels. The action set-pieces are fantastic, yes, but it's the characters that make the novel, and the ending in particular does them a disservice. Sebastian's dragon-brood at least get the time they deserve, and their relationship is far deeper for it. I do appreciate the novel's blend of epic and heroic fantasy tropes. The threat may be massive; the location is more confined, so we have a far richer sense of place. The fate of nations may be involved; the nations are frequently petty, squabbling, and decisions made for very personal reasons. It's a good mix. All in all, I'd definitely recommend The Iron Ghost. Admittedly, it can be uneven in parts, and I hope the sequel allocates more time to gradual development, rather than the jolting resolutions that were used for certain subplots. But as a whole, it's a massively enjoyable cross between the heroic and the epic which won't fail to keep you reading, with engaging characters, a truly fun villain, and a climax that left me wondering: where next? DreamHost is ultimately the best hosting company with plans for all of your hosting needs.